Hackforums - one of the popular hacking forum in the world - has been hacked and defaced by the famous Egyptian hacker with the online handle Eg-R1z. HackForums is popular among both whitehats and blackhats. On one end of the spectrum, HackForums helps over 110,000 hacking community members to remove dangerous malware off of their computers, as well as promotes research and learning of various malwares. But on the other end, it servers as a great platform for hackers and cyber thieves as well, who posts infected material in order to victimize others. The website is hosted in Europe on a server and expected to be earning an estimated $7,316 USD on a daily basis. "[403 Forbidden Error] - You might be blocked by your IP, Country, or ISP." That's really nasty msg guys , don't u think so?! It is still unclear, how hacker managed to get into server and which type of vulnerability or weakness has been exploited. 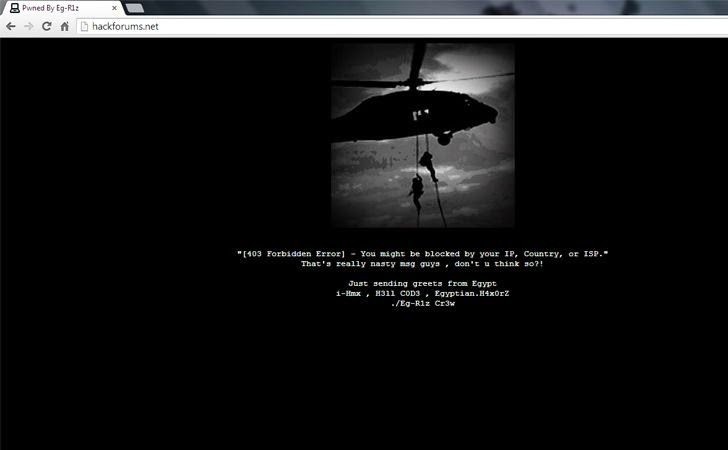 But, it seems that the hacker just exploited some flaw and defaced the website and then hosted the image on hacked server which was displayed on the defaced page. Reason behind the defacement of the website is still unknown, but with the deface message, one can predict that the hacker is warning the HackForums admin about security. The forum was unavailable for few hours last night, but at the time of writing, the site was back to its normal form, but site performance is still facing some issues. You can check the defacement mirror of the hack at Zone-h as a Proof of Hack. It’s not first time HackForums website got hacked. In past, HackForums website was also hacked by various hackers with online handles imLulzPirate, b0x, SYRIAN-HACKER and KTN.